Spermophilus tridecemlineatus is an omnivore consuming both heterotrophs and autotrophs, in equal amounts. The animals consumed include insects (grasshoppers being the squirrel's favorite), their eggs, wireworms, ants, cutworms, caterpillars, beetles, earthworms, and carrion. Seeds, especially sunflower seeds, nuts, grasses, clover, green shoots, flower heads, roots, fruits, vegetables, corn, wheat, and other cereal grains are the vegetative foods the squirrel ingests. Drinking water is not a necessity since most of the plants consumed are succulent and the squirrel is able to manufacture its own water metabolically. Depending on the season and time of year, the diet of the squirrel varies. In the spring, fresh grass is readily available and is the dominant food source. The main vegetative sources switch during the summer when fruit, nuts, and crops are produced and abundant. Plant matter food is hoarded through out their active months, to be consumed during harsh weather. A supply of food is saved until spring to be used after arousal from hibernation when food is scarce in addition. 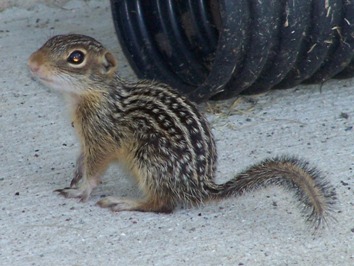 The squirrels carry seeds and grasses in their cheek pouches to be taken back to their underground burrows where the food is placed in a storage chamber. During hibernation food is not usually consumed and the main source of energy during this time period is hydrolyzed lipids from stored adipose tissue.